Back in the spring of 2009, I decided to make a serious attempt at making some everyday dresses, since they’re an easy wardrobe option and since finding cute, well-fitting, and unique dresses off the rack is almost impossible. The idea was that having lots of custom-made, perfectly fitting dresses would make getting ready for work in the morning much easier, especially in the summer, when every outfit has to be weighed against the potential for sweating through it during my commute. I didn’t get very far that summer in terms of starting projects. 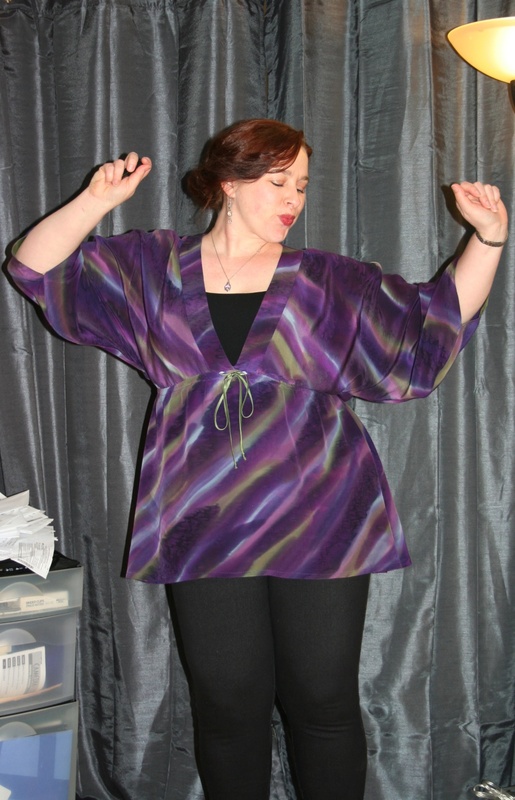 I’m really good at planning the projects–and really good at buying the patterns and materials–but I’m a bit slower at putting the garments together. In fact, I completed only two. But that’s really because I wanted to make sure they were constructed well and fit well, and I hadn’t had much practice at fitting and making normal everyday garments–I had much more experience fitting Renaissance garb. It’s a lot easier to make a garment that shapes the body than it is one that fits the body’s natural shape. Anyway, I’m very happy with the two dresses I completed in 2009, and thought I’d share them here, since they’re my first non-Renaissance projects in years and since they both involved a considerable amount of learning. They’re not perfect, by any means. But probably nothing I’ll ever sew will achieve perfection. That said, they’re good enough to merit mention here. So I’ll start with my very first dress: the teal dot strapless sundress. Outer: Light blue-teal quilting cotton with darker teal, olive, and lighter blue overlapping dots—they look a little like bubbles in pond water to me. I wanted to start with something fun, cute, and sassy. 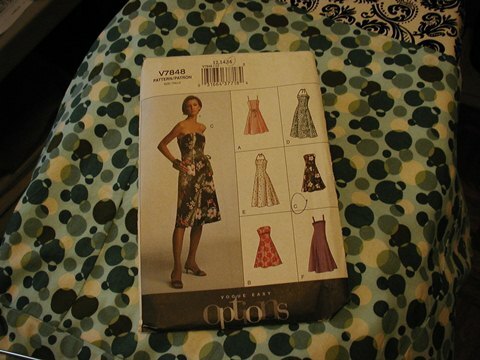 This is a simple, cute, and easy-to-make Vogue pattern, although it did stretch my skills at the time. But it proved to be the perfect way to start my dress-making project. I originally cut out a size 16, according to my measurements, but because pattern manufacturers INSIST (apparently) on vanity sizing, I had to cut it down to a 14 after test-fitting the muslin, which then became the lining. The pattern doesn’t call for a full lining, only a bodice lining, which is boned. But because the cotton was lightweight, I wanted to make sure the effect wasn’t transparent, as I hate wearing separate half-slips with dresses and skirts. So I fully lined the body of the dress with the muslin, then attached the boned bodice lining per the directions. I machine-stitched the zipper instead of using a hand finish (baby steps). But I did hand-sew a blind hem—or what was supposed to be a blind hem, and turned out to be not-quite-blind in some areas. But that’s okay. It was the first time I attempted a blind hem, and I’m happy enough with the results. The only person who’ll know it’s not a perfect blind hem is me—or another knowledgeable sewer who gets a close look. I machine-stitched the lining hem, because it’s the lining and only muslin, and I didn’t want to spend a lot of time on details that just aren’t that significant, especially for a dress that’s just for casual wear. After the construction was complete, I thought the dress was missing something. The shape is good, the fit is good, I love the material, but it just needed something. So I found some 1-inch-wide teal grosgrain ribbon and played with placement on the dress bodice. I ended up stitching one length at the neckline, just below the edge, so you can see a bit of the dress fabric above the top edge of the ribbon. Then it looked a bit top-heavy, or my eye was drawn too much to the top. So, since waist definition is rarely a bad thing, I sewed another length of the grosgrain at the natural waistline. I really like the finished effect. The beauty of a princess-line dress is that it helps smooth over the waist area and creates a wonderfully uninterrupted, sleek line. But for this particular dress, the fabric’s design needed a bit of breaking up, and the ribbon was the perfect solution. I haven’t actually worn this dress out of the house yet (and it’s now 2011) because it’s maybe a bit too sassy for everyday wear, even in a very casual office environment, but I’ve put together some great outfits based on it, and this summer I WILL WEAR IT.